The new zero day exploit has been discovered and being exploited in the wild. This can be used to load malicious application on victim machines running fully patched Windows XP SP3 along with the latest editions of the IE 7 and IE 8 browser and Adobe's Flash software. Eric Romang was examining one of the servers used to launch attacks on vulnerable Java installations in past, and he says that he has found a new zero day exploit for Microsoft's Internet Explorer web browser. He said, "I can confirm, the zero-day season is really not over yet." AlienVault Labs researcher Jaime Blasco reported that, "the gang behind the Java attacks in August and September may be moving on: with domains used in that attack located at new IP addresses and serving up the new and more potent attacks." 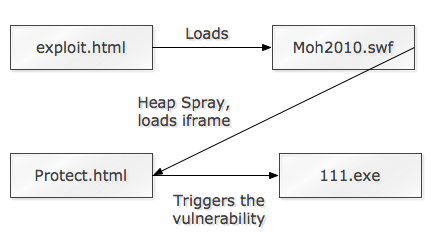 As shown in above image example, the file exploit.html creates the initial vector to exploit the vulnerability and loads the flash file Moh2010.swf, which is a flash file encrypted using DoSWF. The Flash file is in charge of doing the heap spray. Then it loads Protect.html. There results also shows that this zero day attack is being used in attacks that install the Poison Ivy Trojan. Metasploit has released a working exploit for this Zero-day.